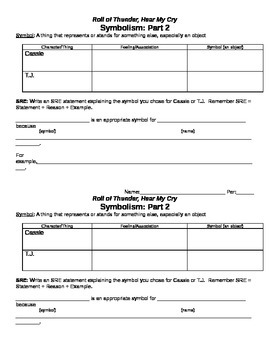 This set of 4 worksheets and 1 quiz helps introduce the difficult concept of symbolism. 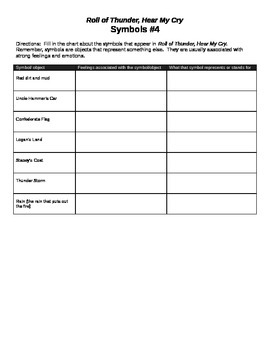 The worksheets build on each other and are meant to be used throughout the study of the novel. 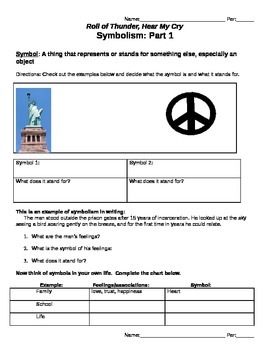 The worksheets start by introducing symbolism with objects students are already familiar with. Then they walk students step by step through identifying and analyzing symbols in the novel. Students are asked to decide on symbols that would represent main characters, as well as identifying symbols the author uses in the book. These are a great way to introduce and reinforce symbolism to middle school readers. If you like this product, see my other activities for Roll of Thunder, Hear My Cry.